This one-day Tokyo foodie itinerary takes you through some of the highlights of Tokyo’s vast culinary scene. 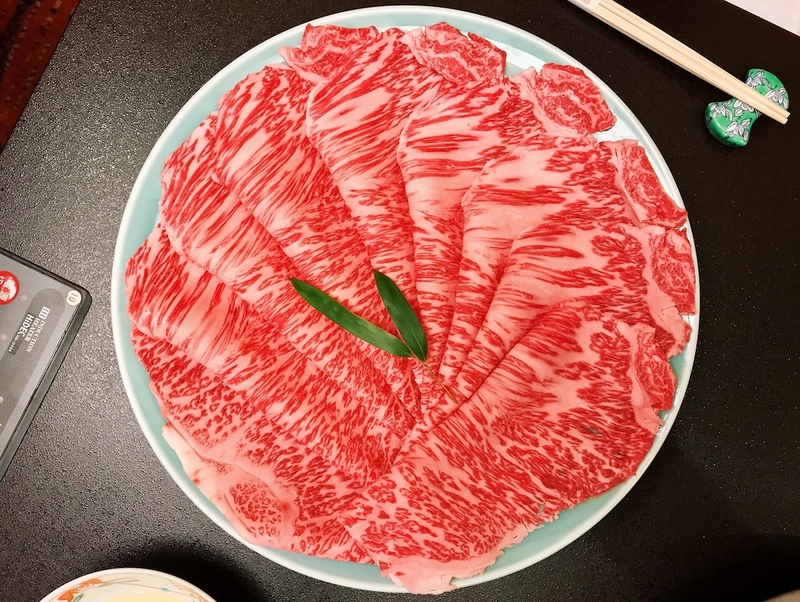 It includes the famed Tsukiji Market, fabulous snacks, the best pizza in Tokyo, and glorious Japanese beef. Besides yatai in Fukuoka, or festival food, Japanese street food culture is not at all comparable to, say, Southeast Asia. Besides ice cream and handheld crepes, it’s quite rare to see anyone eating while walking on the street. What you can do, however, is pick up small snacks and find a quiet bench or park to eat. Markets here are usually working markets. The shopkeepers cater to locals and regular buyers first and foremost, and while tourists are generally welcome these days, it’s important not to disrupt business. If you do wish to take photographs, ask first, and be discreet and respectful about it. If there’s a sign that says don’t take photographs, respect it! And don’t bring your suitcase into the market - it’ll make already crowded places even harder to navigate for you and for everyone else. Finally, we’ve put all of the places listed here, and the walking routes in each area, on a special map of this itinerary. Scroll down to the end of this itinerary to view the map. This is where the raw materials for Tokyo’s culinary dreams come from. If you must queue for a breakfast of sushi, this is the time and place to do it. 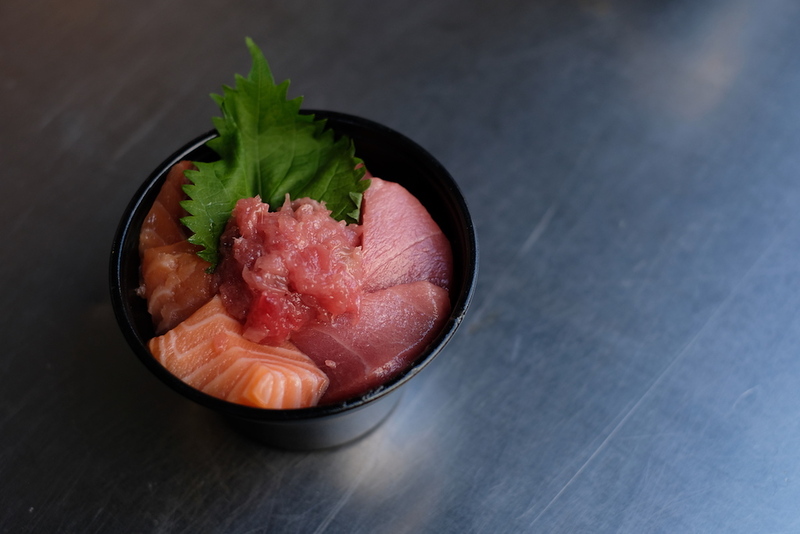 There’s nothing like beginning your day with fresh, sweet, raw fish. Although the central wholesale market has been moved to Toyosu as of October 2018, there’s still plenty to see and eat in the Outer Market. Make a beeline forまぐろや黒銀 Maguroya Kurogin, and start queuing. 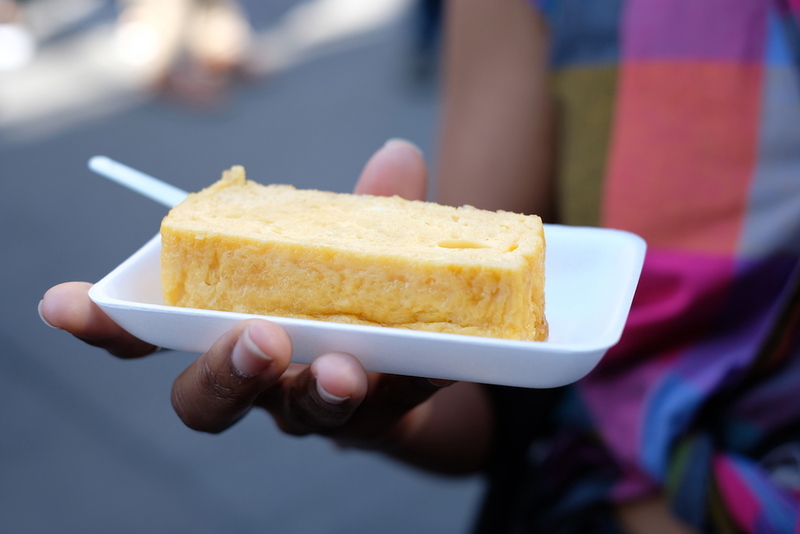 If you’re with a friend, make them stand in line while you run a few stalls down to丸武 Marutake for a tray of tamagoyaki, or Japanese-style omelette. Each slab of omelette is warm and straight from the pan, at once sweet and savoury, eggy with a hint of mirin (sweet rice wine). It is a damned good snack to whet your appetite while you wait. Maguroya Kurogin is all about the bluefin tuna. There’s all manner of rice bowls and nigiri-style sushi (rice with slices of fish on top) featuring this ocean god. 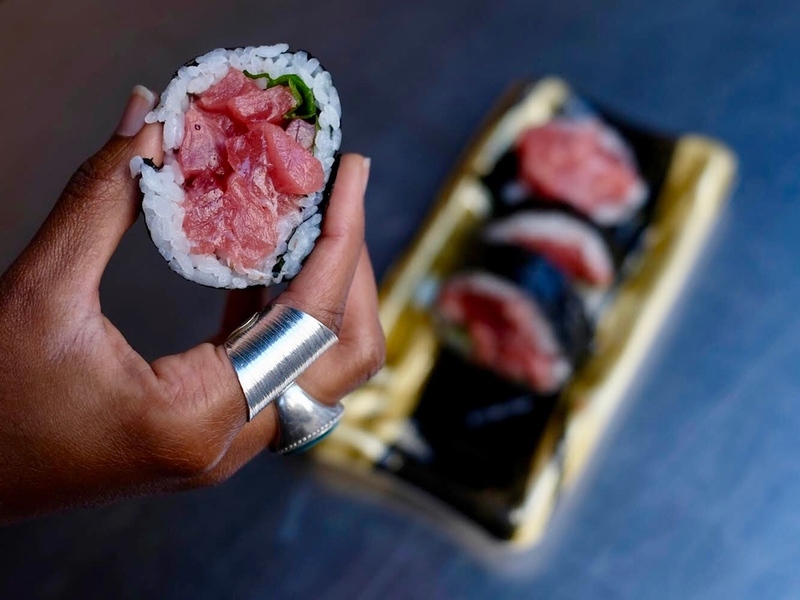 Get their famous magu-roll (tuna hand roll). Think 4 pieces of piscine heaven: goodly amounts of tender, raw, hand-chopped tuna, held together with just the barest amount of rice and seaweed. But we’re just getting started. Order a rice bowl to follow your magu-roll. You could live large and order the otoro (fatty tuna), but even less oily cuts like chutoro (medium fatty) and akami (lean) will have you swooning. Negitoro is also a fabulous choice: hand-chopping is the key to its luscious texture here. Finish up here and walk through the market along this street. Sample what you can, and duck into side streets and alleyways if you must, but ultimately, you should keep going. Look for にっしん太助 Nisshin Tasuke, a freshwater eel specialist further up the road on your right. You could sit down for an entire unagi rice bowl, but if you haven’t the time nor inclination, grab yourself a couple of skewers. 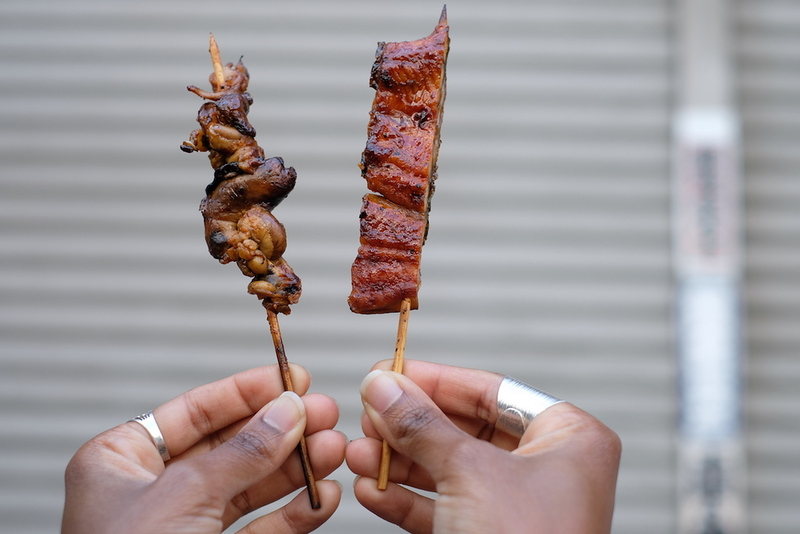 The liver is not at all bad, but the prize here is the classic eel skewer. Dipped in marinade and briefly warmed again on the charcoal right before you, its mackerel-like, oily, flaky flesh makes a fantastic snack. It’s also perfect for eel beginners. Just adjacent to Nisshin Tasuke is a corner shop with a permanent queue in front of it and a display full of candy-colored confections with strawberries on top. Welcome to Soratsuki. It’s hard to go wrong with a snack like freshly pounded mochi (rice cakes). 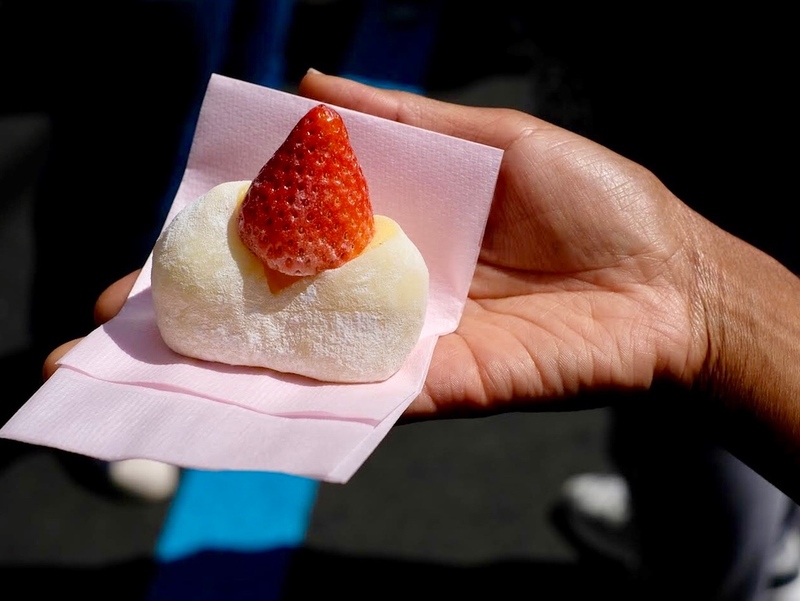 Try the custard-filled mochi - it’s soft and pliant, with thick, oozing custard within. Once you’re done exploring this street (and the rest of the market, if you’re so inclined), walk out towards the main road and turn left. You’ll find yourself at 伊勢啓 Isekei, an old-school purveyor of katsuobushi - skipjack bonito flakes. It’s time to sample some, and pick up a bag if you’re serious about cooking. 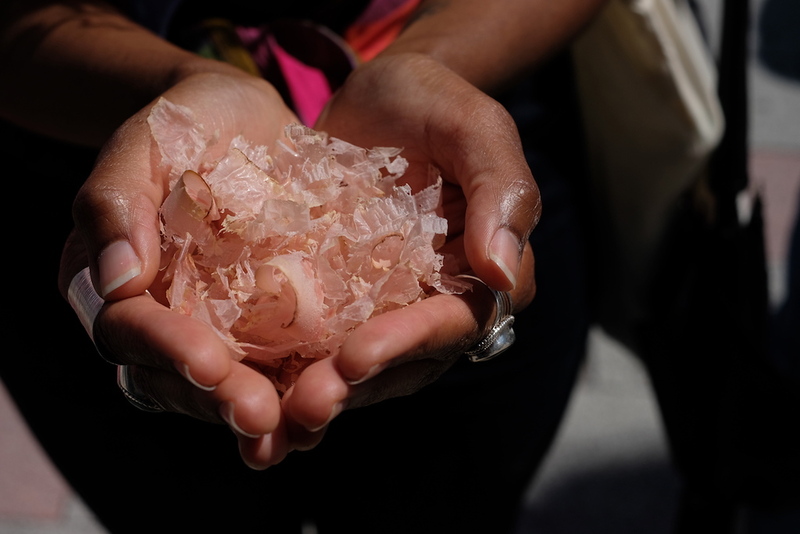 These innocuous papery pieces that look like pencil shavings are used to make dashi stock, and they are at the heart and soul of Japanese cuisine. There are a few shops around Tsukiji Market, but the freshly-shaved handfuls of honkare katsuobushi here have an especially smoky, meaty soul to them, as though they’ve been sprayed with some fabulous soy sauce. It’s a far cry from the papery plastic-wrapped stuff at the supermarkets. If you'd like to explore this area with an expert guide, check out Chris Rowthorn Tours' Tsukiji Fish Market Tour. Take the Hibiya line to Tsukiji Market. Exits 1 and 2 are the nearest to the Outer Market. From Exit 1 [coming from Ginza], turn left once above ground, and follow the signs to Tsukiji Market, walking along the main road. A good indication is also to follow everyone else. Eventually, you should see a Jonathan’s family restaurant on the opposite corner. Cross the road to reach the covered shopping arcade marking the perimeter of the Outer Market. To find Maguroya Kurogin, walk under this arcade until you reach the corner of the junction. Turn left and it’s on the corner of the next street parallel to the main road. Marutake is a few stalls down in the direction you’ll be walking in. Nisshin Tasuke is towards the top of the narrow road lined with shops and restaurants, also parallel to the main road. It’s time for a post-prandial digestif. Luckily, the espresso-based pours at nearby Turret Coffee are some of the best in the metropolis. A short latte was wonderfully full-bodied and smoky - if cigarettes tasted like this I’d be hooked. The classic Turret iced latte, equally delicious and smoky, will do you good on a hot summer day. Have your drinks inside to avoid generating more paper cup wastage. From the Outer Market, cross the road diagonally, walking back towards Exit 2 of Tsukiji Station. Keep walking past it until you see a Starbucks on your left. Turn into the road; Turret Coffee is a few doors down. Opening near Starbucks - what a bold move! Coffee is a fantastic digestive. By now, you’ll have digested breakfast - right? Make your way to Ginza for your next snack at Ginza Kimuraya. 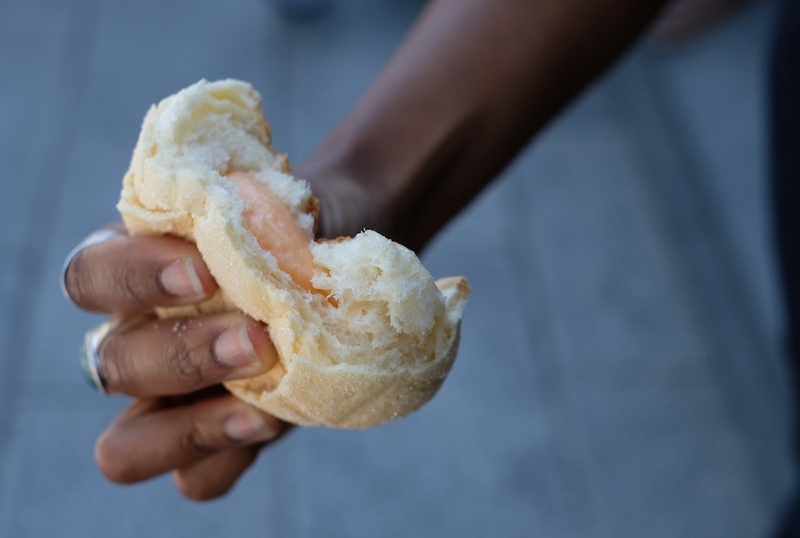 Their melon bread, or melon pan, is some of the best Tokyo has - wonderfully fluffy bread with an addictive sugary crust. Even better is their melon pan filled with melon-flavored cream. Don’t forget to also pick up one or two of their best-selling anbata-pan (azuki bean butter bread) and put it in your bag for later. Trust me on this. Return to Tsukiji Station and take the Hibiya Line to Ginza Station. Take Exit A9 and you’ll see Kimuraya right outside. Alternatively, if you’re not hungry, skip Ginza and head straight to Nakameguro - see below. By now, Ginza’s famous department stores are starting to open their doors to the public. Head to Mitsukoshi Ginza right opposite for your next culinary adventure. Like any department store worth its salt, it has a food hall and a separate supermarket floor, and are they ever impressive. The sheer range of offerings is mind-boggling: truffles, honey tarts, wine-stewed chicken liver, eclairs, mounds of salad, freshly-fried croquettes, boxes upon boxes of individually-wrapped confections, a cornucopia of pickles, gorgeous fruits, rice crackers, far more bottles of sauces and seasonings than there are corrupt politicians in the White House. You’re on holiday. Eat it all. New York’s Dominique Ansel Bakery has an outpost here, with almond croissants the size of your face, coffee bread in the shape of coffee beans, and the all-important giant cronuts. No one’s that crazy about cronuts anymore, but if you didn’t get one years ago when the hype was huge, this is as good a time as any to try one. Weekly or fortnightly pop-ups at department stores are also common, meaning that there’s always something new to look forward to on each visit. A super fun snack I came across: shiitake mushrooms stuffed with minced prawn, deep-fried until just cooked and still juicy, sprinkled with salt. Fabulous straight out of the fryer, strictly for those without mushroom phobia. I also love food halls for the range of salads. R1F Sozai has outposts at many food halls in department stores, specializing in consistently fresh, inventive, and delicious salads sold by the 100g. Think, for instance, slippery, delightfully crunchy seaweed salads with baby fish and ginger juice dressing, or creamy avocado, chicken and basil salads. But my favorite thing by far to eat at Mitsukoshi Ginza is the 月見つくね tsukimi tsukune, or moon-viewing meatball, at 和四五郎 Washigoro. (How romantic!) 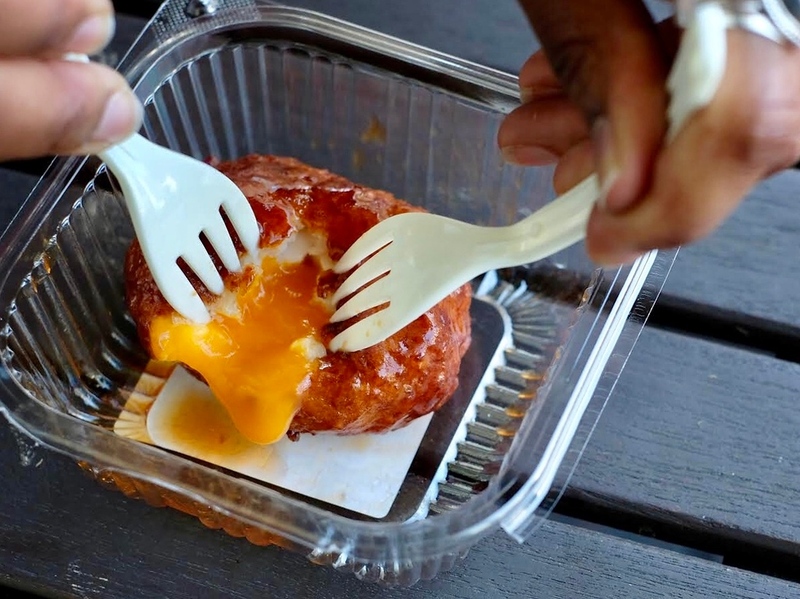 This is Japan’s answer to the Scotch egg. Think a golf ball-sized hunk of minced chicken, grilled and liberally glazed with a sweet-salty sauce, a whole egg inside. The yolk always, always, oozes perfectly. Step aside, Scotch egg – Japan just does it better. From Kimuraya, cross the road and enter Mitsukoshi Ginza, which opens at 10:30am. Head down to B2 for the food hall. Any food purchased can be consumed on the 9th floor, home to a lovely open rooftop patio and field for chilling out. Nakameguro is Tokyo hipster heaven. It has a ridiculously high concentration of quirky, arty bookstores, independent craft shops, and clothes labels that all look like they belong in Kinfolk. It is also the home of the pizza gods. You might be in Tokyo, but pizzerias here give Italy a damned good run for its money. Enter Seirinkan, an entirely unassuming restaurant in the backstreets of Nakameguro that serves up one of the best pizzas you will ever eat in your life. 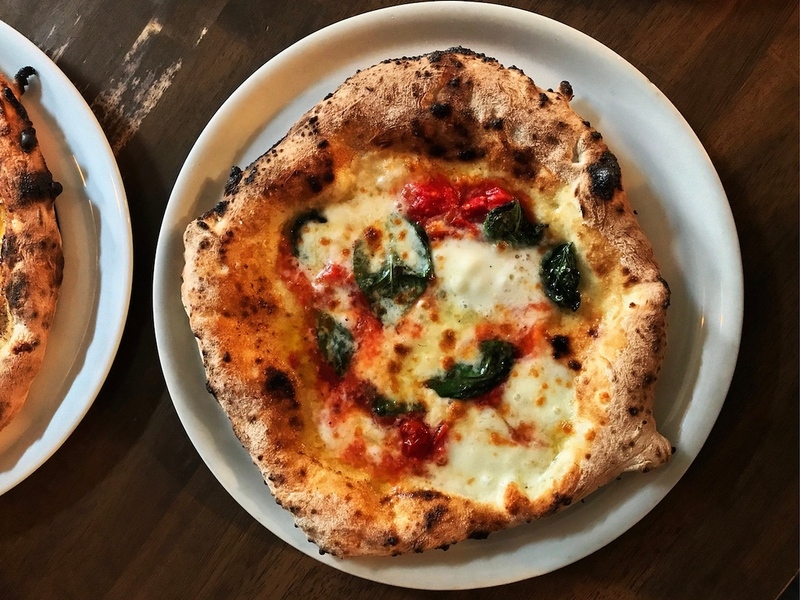 There are side dishes and snacks, sure, but you know Seirinkan is serious because they have just two choices of pizza - the margherita and the marinara. Both are ferociously good. The wood-fired crust is gorgeously charred, with a perfect, lightly springy pull when you tear at it with your incisors, with fine flecks of sea salt in every bite. On average, I never eat pizza crusts without the topping; here, nothing is left on the plate. Here, it is all about the crust. The margherita is one of the finest examples I’ve ever eaten, with perfectly fresh and creamy mozzarella. The marinara pizza is liberally drenched with a puddle of sweet roasted tomato sauce and slivers of garlic, all of it singing summer in your mouth, transporting you to Italy with a single bite. No element of the pie is overlooked. If you have to choose, don’t. Eat both. You’re witnessing the pinnacle of pizza craftsmanship, and it is your duty to consume its fruits. Head down to Ginza Station, accessible from B1 of the department store. 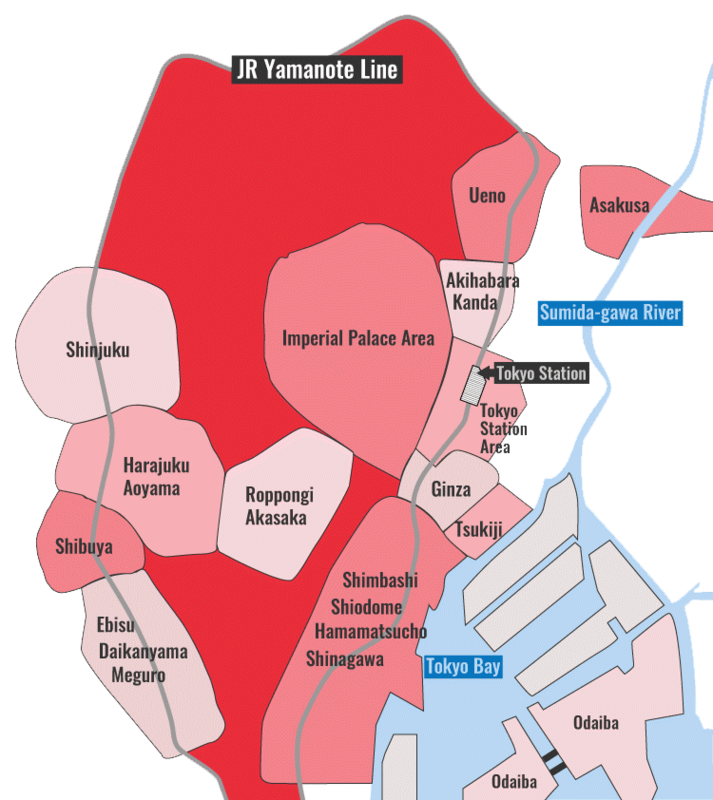 Take the Hibiya Line from Ginza Station all the way to the end of the line at Nakameguro Station. Take the South Exit. Seirinkan opens at 11:30am, and there may be a short queue by the time you arrive. Arriving before noon is generally a good idea to be seated sooner. Once you’re in, ordering is simple. More coffee? But of course. 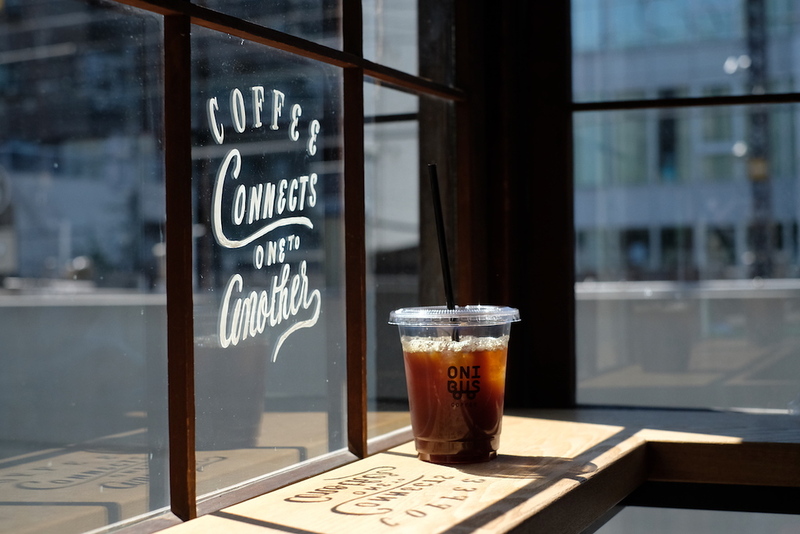 A favourite with coffee fanatics in the city, this charming coffee stand in Nakameguro keeps it simple with coffee, coffee, and more coffee on the menu. 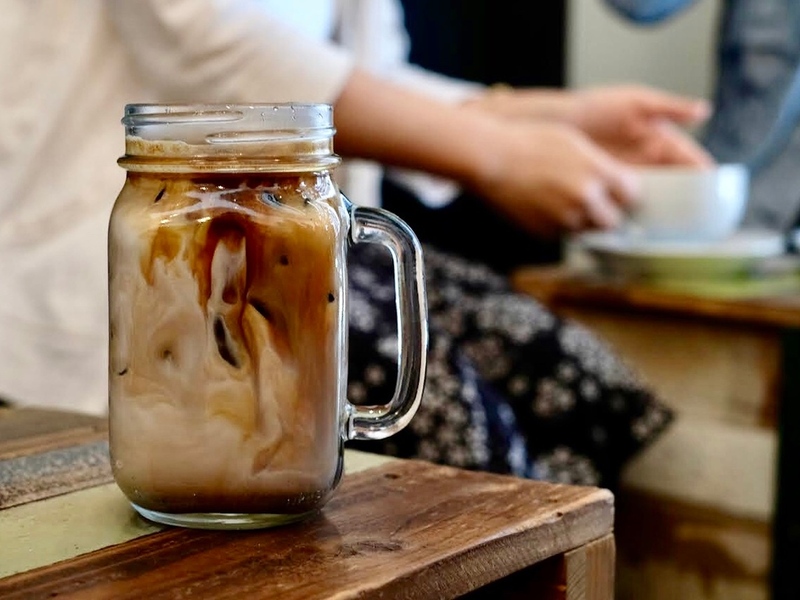 When we visited, the iced coffee was a deeply smoky yet juicy roast that tasted like late nights in an underground blues bar, complete with ragged baritone songs and cigarette smoke clinging to your hair. Perfect for a warm spring day. To go with your coffee, it’s time to bust out the snack from Kimuraya you’ve been saving for this moment - the anbata pan. 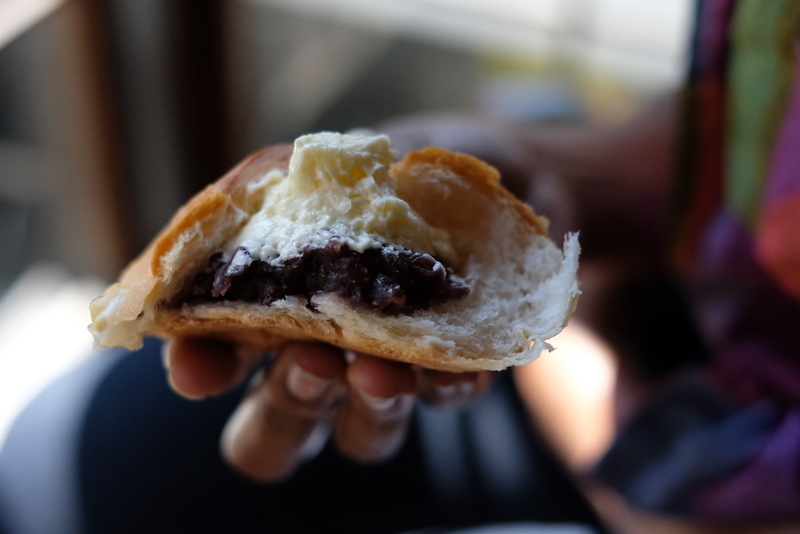 A dollop of creamy whipped butter alongside and inside the fluffy bread adds that requisite lightness, making a beautiful counterpoint to the sweet red bean paste, preventing it from being too cloying. It is one of those genius East-West fusion confections that just work. Consider red bean haters like me sold. Onibus Coffee, near the train tracks, is a quick 2-minute walk from Seirinkan. 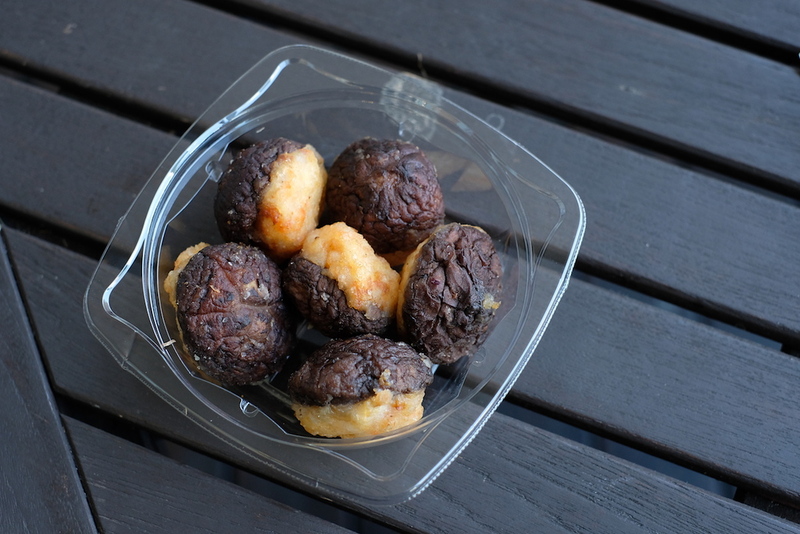 3 o'clock in the afternoon is oyatsu no jikan in Japan - otherwise known as snack time. What better way to mark this hour than ice cream? Get thee to Japanese Ice Ouca, a stylish ice cream parlor a short walk away from Ebisu Station. 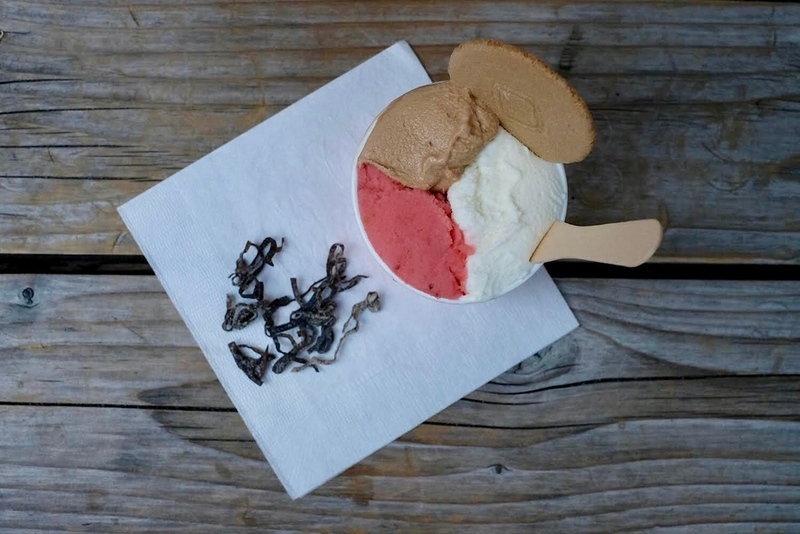 The style of scoop here is lighter and decidedly creamy, each flavour quietly asserting itself. I love the kinako (roasted soy bean flour) ice cream here - it's deeply, delightfully nutty. But the real genius is in the way the ice cream is served. At Ouca, each serving of ice cream comes with strands of salted kelp, which act as palate cleansers between each sweet, blissful mouthful. Ouca is 20-25 minutes’ walk from Nakameguro, or a short train ride from Nakameguro Station. To get there by train, take the Hibiya line one stop to Ebisu Station. It’s a short 2-minute stroll from the west exit of JR Ebisu Station. They’re happy for you to sample some of the flavours if you can’t make up your mind. One ice cream is not enough - a productive day of eating demands at least two. Your next stop is Nanaya. If tea can be thrilling, No. 7 certainly is. I felt like I was back at a tea ceremony in Kyoto all over again drinking koicha, the thick matcha tea that marks the climax of the entire ritual. It’s so viscous it has the consistency of rapidly-cooling lava. Nanaya’s No. 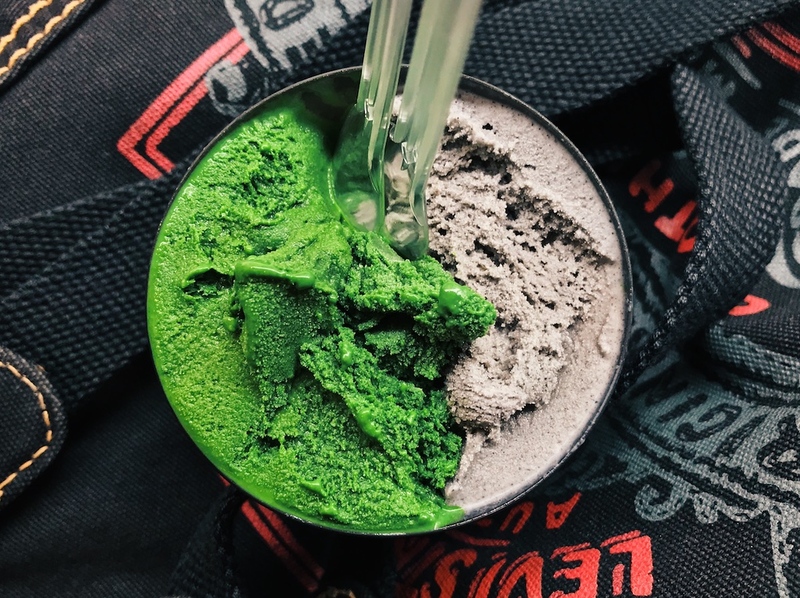 7 is koicha in gelato form - an intense blast of matcha that will ruin all other green tea ice creams for you. Return to Ebisu Station and take the 田87 bus bound for Shibuya Station. Alight at the Namikibashi stop. From here, it’s an approximately 10-minute walk away. Or, live large and hop into a taxi. So far, no sampling is possible at Nanaya. After an afternoon of snacking, you’ll need something simple, satisfying, and luxurious enough to make further eating worth it. And there are few better meals that fit the bill than sukiyaki. Sukyaki is uncomplicated: thin slices of beef are slowly simmered in a blend of soy sauce, sugar, and sweet rice wine in a shallow pot, alongside fresh vegetables, tofu, and tangles of konnyaku noodles (devil’s tongue noodles). But all that means is that there's little to hide behind. Everything hinges on the quality of each ingredient. One of the best, most accessible places for great sukiyaki in Tokyo is the old-school Ningyocho Imahan, which has multiple branches across the city. Their sukiyaki is consistently and uniformly excellent. The ‘quality’ beef selection is good; but the ‘high quality’ sukiyaki will send you into paroxysms of pleasure. 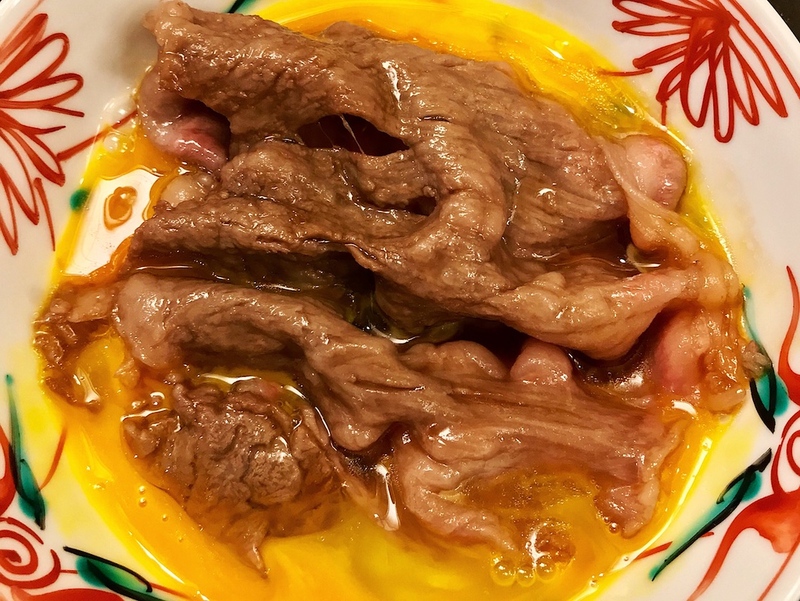 Think palm-sized slices of lavishly marbled Japanese beef simmered in a sweet-salty sauce until just cooked, dragged through a puddle of raw egg yolk. It is as glorious as it sounds. Walk to Shibuya Station and take the Yamanote Line to Shinjuku Station. Find the Takashimaya branch of Imahan on the 14th floor of Takashimaya Times Square nearest the Southeast Exit. At 6pm, there is not particularly likely to be a queue. Reservations are possible - ask your concierge. It’s time to finish your day in style. 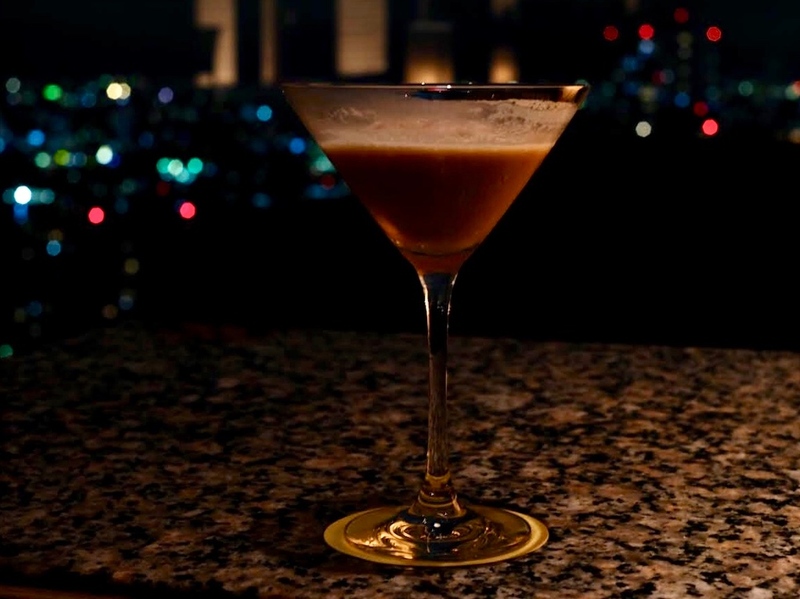 Head to the Park Hyatt and re-enact your very own Lost in Translation moment with cocktails at the sky-high New York Bar. Classic drinks abound, as well as plenty of non-alcoholic options, but you’ll want some space to try the Japanese cocktails. The Rin, made with white wine, yuzu shrub, soda water, and the gorgeously flowery ‘Roku’ craft gin, is something real special. Take a taxi from Takashimaya Times Square to New York Bar. Otherwise, it is a 20-minute walk. About the author: Florentyna Leow is a writer and photographer based in Tokyo. When she's not eating or roaming the streets for food, she can be found with a book and pen in hand. Her work has appeared in Lucky Peach, Roads & Kingdoms, and Kyoto Journal. Her photographs can be found at @furochan_eats, @doorwaysofasia, and @lovemeleafme on Instagram. Many thanks to Kat Chetram for hand modeling and photography assistance. The Foodie Itinerary map shows the location of each of the places mentioned - you can view a full screen version too.